We love rooftop solar at Cost of Solar, because it works, it’s proven, it’s getting more affordable every day, and it uses a space that is often mostly empty – the roof of our home. But putting solar panels on your roof isn’t the only way to get solar power at home, as there are also options for ground-mounted or pole-mounted arrays, if that configuration would work best in your location. There’s also another building surface that is often exposed to the sun (or at least to indirect sunlight) throughout the day that could be used as a potential energy source, and that’s the windows of the building. Of course, if the windows were covered in conventional solar cells, they wouldn’t be very good windows, as no light would come through them, and it would block the outside views for the residents. Until recently, attempts to create transparent solar cells that could be used in solar windows have yielded only opaque cells, which let some light through, but aren’t even close to being transparent, or optically clear, enough to use as a functional window. However, one solution has been developed, and it’s not from a solar company, but rather a glass company, SAF-Glas, and their EnergyGlass promises to change the solar window market. EnergyGlass, said to be the only “Optically Clear Building Integrated Photovoltaic Window System in the World,” is a laminated glass solar window which uses inorganic nano particles to redirect some of the light spectrum hitting the window toward the edge of the glass, where a special ‘edge collector’ converts the energy into electricity. In addition to harvesting direct sunlight, EnergyGlass can also put ambient, indirect, and artificial light to work, and can produce electricity even under lower-light conditions. 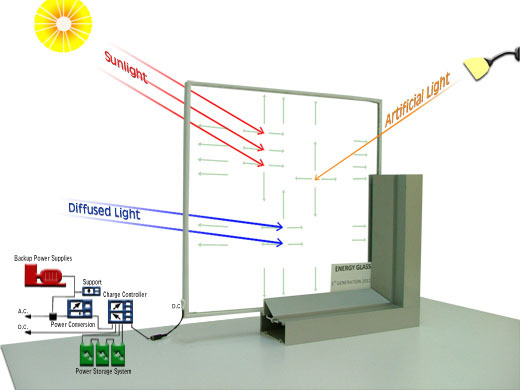 SAF-Glas claims their solar windows can produce 1 to 2 watts per square foot over a 10 to 12 hour day, and a peak of 3 to 4 watts per square foot, depending on the location. The electricity generated by the solar windows can be sent to an inverter and then on to the grid, or can be set up to charge a backup battery system, or even used directly by equipment requiring DC power. The edge collector used in EnergyGlass windows allows for installers to route the wiring inside the window mullion, and the windows can be installed using exactly the same methods as any standard window unit is. According to the company, because of the potential for solar power production with EnergyGlass, especially in commercial buildings, tax breaks, feed-in tariffs, and other solar incentives may be available to defray the costs of installing them. Find out how easy it is to go solar today!